If you have been anywhere near West Campus, the new West Village, standing tall amongst the residence halls, has surely caught your eye. The three-story construction, which opened in August, houses a variety of amenities for students, faculty and staff. Seen as a mini-Clough, it is home to five new Georgia Tech dining options, as well as two restaurants found nationally. On the first floor, a modernly-designed Panera Bread is alluring in its ability to invite visitors in for a meal. Unlike most commercial restaurants on campus, this location allows those who are dining to use their MyPanera card, and redeem offers, as they would be able to do at any off-campus Panera Bread location. The seemingly Pinterest-inspired stairs lead up to the second floor, where the main Tech dining is housed. A wide range of food selection is presented, with everything from food made on the grill, upscale Italian pizza and pasta and locally-grown poultry and produce, to breakfast treats, vegan, peanut free options and eclectic Middle Eastern and Asian cuisine. While some study rooms are available on the first floor, the majority of them are situated on the top floor. These spaces are similar to the renowned breakout rooms scattered across Clough, but are available on a first-come, first-serve basis. Although there is no rooftop garden, perhaps some of the most notable features have been the breathtaking views of Midtown from the outdoor balconies and the calming atmosphere set by the water fountains in the green space below. While many visitors have been ecstatic about the addition, returning students and West Campus residents have mixed opinions. Village. Woody’s, formally known as Woodruff Dining, previously served as the only buffet-style dining hall on west campus, similar to Brittain and North Avenue on east campus. For first-years, the concept of Woody’s is highly unfamiliar, yet many wish that they could have an unlimited meal plan, or that there was a restaurant within West Village that served only breakfast. Students have consistently complained about the treacherous wait times for their food, especially during prime hours. Kajzer added, “West Village needs to serve more fruit.” In contrast, another freshman, Sunny Wang, approves of the restaurant known as Farmhouse. 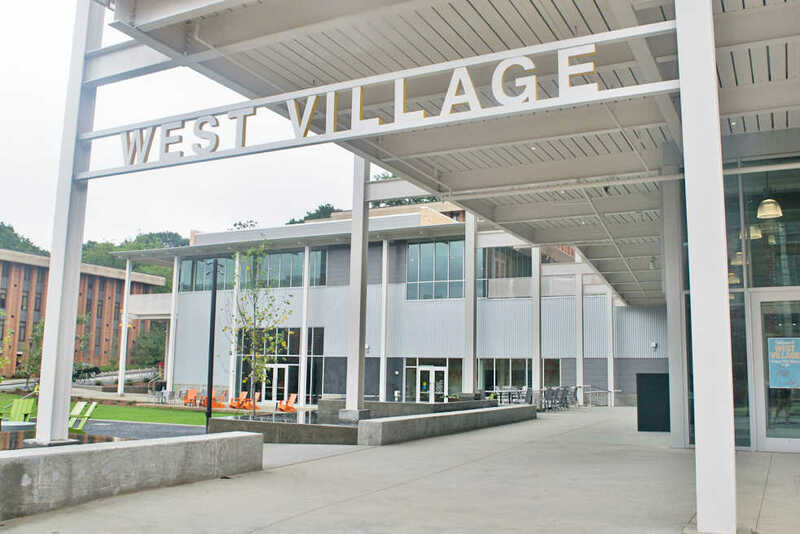 With a change in freshman meal plans, students have expressed frustration over not being granted unlimited swipes, which limits how much food they can enjoy at West Village. A meal swipe at West Village only covers meals up to $9.00 in value, and for many, the portions are extremely small. Nisha Detchprohm, second-year ME, said, “Closing Woody’s makes it more expensive for students.” Many have found West Village to be pricey for a meal plan option, especially those who do not have one. As an alternative, those living in apartments are eating significantly less healthy food, since they do not always have time to make a grocery run or cook their own meals, and spending $8.00 to $9.00 on a meal everyday is not very feasible. For the most first-years at least, West Village seems to be a unique asset to West Campus. Those who spent second dinners at Woody’s on an unlimited meal plan during the past year may feel that the replacement could have been better. Regardless, there is a universal consensus that the tech-savvy construction is optimal for hitting the books and relaxing at the end of the day. West Village, welcome to Tech.